bareFTP is a file transfer client supporting the FTP, FTP over SSL/TLS (FTPS) and SSH File Transfer Protocol (SFTP). It is written in C#, targeting the Mono framework and the GNOME desktop environment. This bug is tagged needs-packaging which identifies it as a request for a new package in Ubuntu. As a part of the managing needs-packaging bug reports specification, https://wiki.ubuntu.com/QATeam/Specs/NeedsPackagingBugs, all needs-packaging bug reports have Wishlist importance. Additionally, since the information provided is sufficient to start the packaging request, we confirm the bug and set this bug's status to Wishlist. Hmm, is it possible to get an FFe and get this package into Karmic? 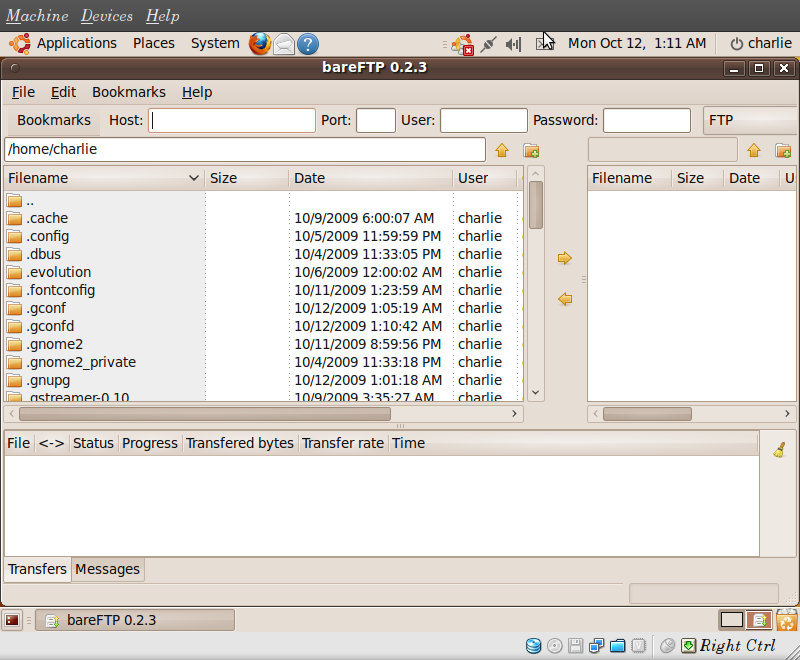 This FTP client looks really nice and since it's not in Ubuntu yet, there is no risk of regression. bareFTP is a new package in debian. It was uploaded to debian on 16 August so the change log only consists of the initial release. Why should we sync this package at this point in the release cycle? Is there a good reason for this? It is a ftp client that I use from time to time and I like it better than gftp. As stated earlier in this bug there is no chance for regression as this is a new package. However I do understand if it is your judgement to wait for it to be auto synced in lucid. Nack from me. This package will be automatically synchronised when Lucid opens its doors. You can then request a backport. Final Freeze is tomorrow and I doubt that you'll find an archive admin to take care of this new package. I agree with Iulian. It is a little late in the release cycle to add this new package. I think it would be best to simply allow it to be synced in lucid.